Cystic fibrosis (CF) results from mutations in CFTR, which encodes an anion channel that mediates transepithelial secretion of chloride and bicarbonate. A hallmark of CF is mucoviscidosis, the secretion of tenacious, viscous mucus that plugs ducts and glands of epithelia-lined organs, including the lungs and intestines. Goblet cells secrete mucins; however, it is not clear if these cells have altered exocytosis in the CF intestine. Jinghua Liu and colleagues at the University of Missouri evaluated goblet cells within intestinal organoid cultures from a murine CF model. Compared to those from WT mice, CF goblet cells exhibited altered exocytosis, including granule swelling and incomplete mucus discharge. Additionally, CF goblet cells exhibited distorted morphology and ectopic granule localization. Increasing the luminal bicarbonate concentration largely restored abnormal exocytosis defects, suggesting goblet cell alterations directly result from loss of CFTR function. Mucin granules within CF goblet cells had an alkaline pH, likely altering the polyionic composition of mucin. Together, the results of this study indicate that epithelial-dependent defects in goblet cell function contribute to mucoviscidosis pathology in the CF intestine and suggest that bicarbonate-containing treatments have therapeutic potential for intestinal complications of CF. 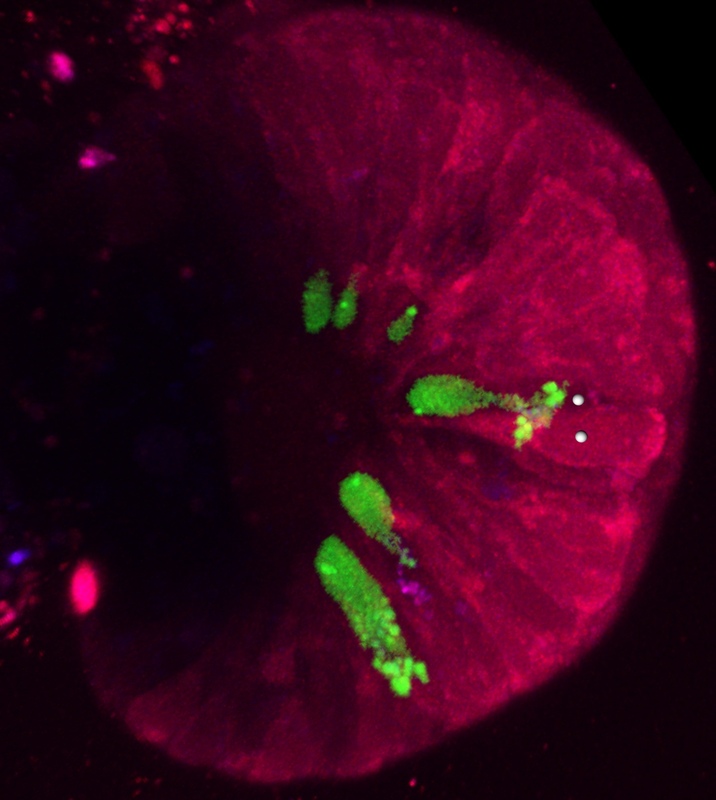 The accompanying image shows the crypt epithelium of an intestinal organoid stained with the pH-senstive dye SNARF 5F9 (red) and with quinacrine to detect goblet cell granules (green). This 3D image was reconstructed by Imaris® software of a confocal Z stack (0.25 μm slices), and virtual measurement spheres placed in the goblet cell cytosol and in the cytosol of an adjacent enterocyte (gray) of a crypt allow precise measurement of intracellular pH. Citation Information: J Clin Invest. 2015;125(3):1056-1068. https://doi.org/10.1172/JCI73193. Cystic fibrosis (CF) intestinal disease is associated with the pathological manifestation mucoviscidosis, which is the secretion of tenacious, viscid mucus that plugs ducts and glands of epithelial-lined organs. Goblet cells are the principal cell type involved in exocytosis of mucin granules; however, little is known about the exocytotic process of goblet cells in the CF intestine. Using intestinal organoids from a CF mouse model, we determined that CF goblet cells have altered exocytotic dynamics, which involved intrathecal granule swelling that was abruptly followed by incomplete release of partially decondensated mucus. Some CF goblet cells exhibited an ectopic granule location and distorted cellular morphology, a phenotype that is consistent with retrograde intracellular granule movement during exocytosis. Increasing the luminal concentration of bicarbonate, which mimics CF transmembrane conductance regulator–mediated anion secretion, increased spontaneous degranulation in WT goblet cells and improved exocytotic dynamics in CF goblet cells; however, there was still an apparent incoordination between granule decondensation and exocytosis in the CF goblet cells. Compared with those within WT goblet cells, mucin granules within CF goblet cells had an alkaline pH, which may adversely affect the polyionic composition of the mucins. Together, these findings indicate that goblet cell dysfunction is an epithelial-autonomous defect in the CF intestine that likely contributes to the pathology of mucoviscidosis and the intestinal manifestations of obstruction and inflammation.